Dugi Guides™ LTD | DugiGuides.com is a privately owned company based in Christchurch, New Zealand founded and created by Dave Farrell (Dugi) in 2005. 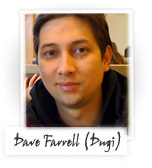 Dave Farrell is a 39 year old male, married and is a father of three young boys. Dave is an avid gamer since early childhood and is a huge fan of Blizzard games. Successful at leveling and gold making with the original release of World of Warcraft in 2005, he shared his knowledge by creating the first ever 50 gold per hour gold making guide focusing on helping solo and casual gamers which was posted for free in the official world of warcraft forums. The overwhelming success and response from the community sparked a demand to create a premium content where it was made available at dugiguides.com. Today dugiguides.com also known as Dugi Guides is focused on developing in-game guides for World of Warcraft with their own custom built AddOn. It was originally a solo project but we have now grown into a team of full/part time staff and partners of professional people that covers the website, programming, game play, guide creation, translation, technical support and marketing. Why would you pay for a WoW Guide? This is a common question that many have wondered because there are many free guides and addons available that can easily be found with our friend google. The ridiculously oversimplified answer would be: Because it’s a better WoW Guide. But of course that would lead only to the next question: What makes a better WoW Guide? A custom made guide takes longer to create and If you want a professional wow guide then you should get it from a professional wow guide creator and not from someone who creates guides and addons in their spare time. All our guides are manually created by us to ensure a correct and accurate path. It was not generated overnight by a database software like addons such as questhelper or carbonite. To create a guide like ours takes a lot of time as we have to repeatedly played the game over and over again to create an accurate path. Our team has been playing and creating WoW Guides since WoW began. We are experts in our field and all the guides are personally directed by me (Dugi). I have played the game extensively and experienced every aspect of it. I was a guild leader for successful end game raids, and also achieved multiple gladiator status the highest level of achievement for pvp, needless to say I am pretty good at this game. What started as a small project of playing WoW and creating guides has become my full time real life profession. I have been doing this for a living for over 10 years, my life and my family depends on the success of these guides. Free guides are usually created by a series of amateurs who create it as a hobby, they have no incentive to create the guide at a high level of standard or update the changes and fix any errors. Other paid guides are often no better, because I have seen multiple companies selling guides with empty promises and only to disappear months later as it quickly becomes outdated. This is because they are nothing but internet marketers out for a quick buck with no passion for World of Warcraft or serving the wow community. We have been operating since 2005 and have customers who are still with us from the very beginning, we are here to stay and we will deliver you the latest updates. When it comes to creating guides for WoW, I am hands down the best person for the job. A good addon will cost a lot of time and money. Not all World of Warcraft guides out there will use an addon, some of them still take the online HTML or PDF ebook approach which is fine if we were still in 2005. But now the WoW API has been improved by Blizzard to allow us to create addons that work seamlessy with our guides. Today playing with an in-game leveling guide is the only way to go. Using a leveling guide without an addon is no longer effective, alt tabbing and reading an ebook guide out of the game will only slow you down. Dugi Guides has invested heavily into hiring 2 addon developers to build our own custom addon for our guide that is designed by me (Dugi) from a gamer’s perspective. A lot of time and development goes into the addon itself, we have to do countless hours of brain storming, programming and testing for us to develop what we believe to be the simplest, most powerful and easiest to use leveling guide addon in the world. We also continously update the addon to offer new features that will improve your gameplay. We also created our one click installer because installing and updating is often the biggest challenge for most users. We develop the latest genre of guides and release them faster than anyone else and we ensure than our guides get updated on time and as error free as possible. Dugi Guides have a long history of being able to provide updates for our guides faster than anyone else. We have managed to release our guide on time for each expansion. We also repeatedly check our guides for bugs or improve it further, whenever a bug is reported you can be sure that it will be fixed immediately. This is something that you will never see with free guides as the authors will only update or fix the guides when they feel like it. It is extremely important to us to improve our guides and maintain it to be as error free as possible for our users because nobody will purchase our guides if we don’t. We were the first to create a new genre of in-game guides including our Dailies & Events, Dungeon and Achievement & Profession guides. These guides are all unique to Dugi Guides and all our users benefit from using them sooner than everyone else, who typically have to wait for months as other guide creators follow in our footsteps. Dugi Guides offers the highest amount of content per dollar than any other guides. We believe in offering the best value for our customers, over the years we have added more content, improved our addon and our prices have only dropped. Why? because our popularity and continued success allowed us to earn more than enough to cover our monthly expenses and keep this website ad free. Technical support costs a lot of time and money which is why you don’t receive it from free addons and guides. All free guides and addons don’t offer any technical support at all which will often waste your time and leave you frustrated. Dugi Guides offers unlimited technical support from the use of our Ticket Support system and also our community forum. We will typically respond to you within 24 hours or sooner if you catch us while we are awake. We can even offer you live remote support and fix any problems that you might have remotely. Well I hope some of the mystery is gone now as to why we must charge for these guides. Without any form of funding it would not be possible for us to create our high quality guide. Dugi Guides is the source for automated in-game WoW Guides, it all starts here. Will Blizzard Block My Account Using this Software? no, people have used our addon for 10 years now and not a single person have been banned for using addons. I installed the trial version and then tried to remove it. But it keeps installing itself, over and over no matter how I try to remove it. Any tips? This is very confusing and quite annoying. Hey, is there a worldquest module thingy yet? Some of these worldquests i seriously never know how to get up that cliffside, or into that cave….etc. What is the annual subscription fee and where do I find. I’m really only interested in the Guide for two months. The annual free is $47, just pay $6.99/per month for 2 months, its much cheaper that way. It’s a great guide, and I have used it a lot. I like doing achievements – and some achievements are not covered by the guide. Obviously there are lots of them. Often when you think of doing something special, it includes coordinates and places. Would it be possible to have a feature in the guide where you can plot in one or preferably a list of coordinates where you want to go, call it something, and then be allowed to run it through the awsome guide system? – the Taxi feature that directs me the fastest way to a location is fantastic. For the list of coordinates I would want two options. a) any order and b) need to be in this order. If we think we come up with a smart “guide” this way, we might even be allowed to submit it to “dugiGuides” as well, for their review – and if approved, it might even be added to next update of the guide? Maybe in a new “custom” division of the guide? – ofc. if we are allowed to expand on this, we might even be allowed to write some text for the coordinates too? – or run a macro to check for a “quest flagged” If we submit it back to “dugi” – ofc. legal stuff will have to make sure they run into no trouble. But, even with the option to just put in one set of coordinates, and area name, and get the fastest way to get there right from the guide, would be great! Dugi Guides is not working for me since the last wow update but I know it will be delt with in due time. I really enjoy playing with the support of Dugi Guides. For me its the best. Are you going to do guide for Battle for Azeroth? What if I quit playing WOW, how do I cancel the guides? Can I pay for a year at a time? I don’t like to pay by the month. I couldn’t find anywhere, how to cancel my subscription. So I canceled at PayPal. I find your guide confusing and frustrating. Others love it, I’m just one that finds it hard to follow. First…Thanks for ALL you do…you have made WoW totally manageable for someone like me who’s a casual player. I have a quick question for you: Do you offer any guides for levelling Archeology from zero in Legion? I have only been able to find digsites in Suramar, but nothing in any other zones…and nothing I can find in any of your guides I have. Does this guide tell me what quests to pick up and which ones to skip due to being poor quests? This would be great as I could skip time waster quests. Our guide now rarely skip quests. It will guide you to pick up quest and complete them in the correct order. Is there any way I can change my payment info in the website or not. Cause I cant find anything that has my payment info on it. and enter your receipt and email to look up your order. I wanted to know if I can buy a guide outright as opposed to doing a monthly membership plan? Hi, we do offer an annual option which is a lot cheaper. I have been with you for years. I am 85 years old and love the help you give. Then, I could no longer load you into addons. I tried and tried and finally cancelled my account with you. Then I tried again, just in case, and there you were. Now Adguard keeps coming on saying click bank is not safe. Hope they don’t block you again. Love you. Hi Gloria, I’m sorry missed this message. Adguard reporting clickbank is not safe is a false positive, I can assure you that the website is safe. Try whitelisting it with adguard. What’s the difference between this product and the free addon for wow? Hi can you open a ticket here https://www.ultimatewowguide.com/tech-support/ provide us with your email info and we’ll try to find it.